COPD (Chronic Obstructive Pulmonary Disease) is a disease that makes it hard to breathe and, according to the National Heart, Lung, and Blood Institute (NHLBI), gets worse over time. COPD is also known as Chronic Bronchitis and Emphysema, a progressive disease that produces large amounts of mucus and causes shortness of breath. The disease is most commonly caused by cigarette smoking. However, according to the NHLBI, up to 25% of those with COPD never smoked. They also say that long term exposure to other lung irritants like air pollution, dusts, and chemical fumes may contribute to the severity of COPD. Although it is progressive and undoubtedly affects one’s quality of life, there are effective ways to prevent or manage this disease. According to the Mayo Clinic, preventing COPD is simple, “The majority of cases are directly related to cigarette smoking, and the best way to prevent COPD is to never smoke or to stop smoking now.” Tobacco cessation is notoriously difficult, and the Mayo Clinic recommends a structured tobacco cessation program for best results. Furthermore, those individuals exposed to chemicals at work should discuss any health and safety concerns with their supervisors. Beyond this clear path of prevention lies a not-so-clear area, disease management and living an active lifestyle with COPD. For many patients, Pulmonary Rehabilitation is an important aspect of the treatment plan. This rehabilitation describes a program that can assist the patient with techniques to help them breathe easier, and exercise regiment, education about the condition and counseling. Exercise is a key element of this rehabilitation and management process. Some of the benefits of exercise for those with COPD are; improved circulation, increased energy levels, and more efficient oxygen consumption. Given the nature of COPD as a pulmonary disease, the most impactful form of exercise is aerobic. With that said, stretching and strength training are also important for a healthy, balanced kinetic system. 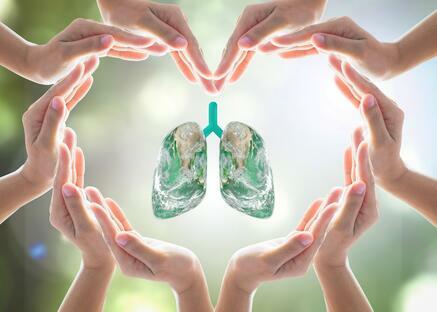 Breathing patterns are important for all individuals, but they are vital for COPD patients. Before starting an exercise program, individuals should consult with their primary healthcare provider. For individuals with COPD, a deeper conversation may be required. Patients should consider how often they should exercise, how long they should exercise, and what types of exercise they should perform. Patients should also review the timing of their medications with their physician before starting their exercise sessions. Through exercise, a better quality of life is possible for individuals living with COPD and that’s a breath of fresh air!